There was a time when the heart of video game design was inarguably in Japan. But increasingly game developers from around the world, including Japan, see that seat of power moving west. Among the developers on hand was the producer of Lost Planet, the designer of Mega Man and creator of Dead Rising and the co-producer of zombie thriller Resident Evil 5. "Five years ago, Capcom was at the very bottom of the industry, it was up to me to figure out how we were going to get us out of this pit," said Mega Man creator and head of Capcom Research and Development Keiji Inafune. "I realized the key word we had to focus on was globalization. It's not that Capcom hasn't had global hits, but there was a long time when key products weren't selling around the world." Inafune said the company realized they had to "strengthen their will", to take risks and create games that traditionally would have been easy to reject. That thinking lead to a revitalization for Capcom, with the developer creating Dead Rising, a free-roaming game about a photojournalist's fight to survive a zombie-infested town and expose the truth to the world. It's also a game with a distinct Western look. "Back when we made Dead Rising I remember distinctly a lot of Japanese development and publishing houses said is this a title that is being developed in the west, because it didn't look like anything being developed in Japan at the time," Inafune said. "It was always our intent to make a game that was distinctly western stylized from the start, so to have other developers tell us that, was the biggest compliment we could have gotten." But when the game hit the U.S., western press and developers noted that while the game looked western, something about it "felt Japanese," he said. Inafune said he realized then that if Capcom was going to do a Dead Rising 2 they should go all of the way and have a Western developer make the game. 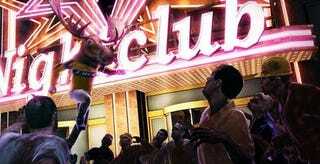 Dead Rising 2: Handyman? Cameraman? When Capcom met with Canada-based Blue Castle Games, the thing that sold them on the developer was the fact that they saw the original Dead Rising as a Western game with some unique Japanese elements to it. "It was that one statement that made me realize this was the one company that could make a proper Dead Rising sequel," he said. "Our big challenge to ourselves with Dead Rising 2 is to try and find the right blend between western design and Japanese design." Inafune added that Capcom isn't trying to "rip off" what is popular in the west, they're after something new, "the perfect combination of western and Japanese game design." One of Capcom's other big titles, Lost Planet 2, has gamers fighting across a slowly thawing frozen planet for limited resources. Interestingly, though, Capcom's Jun Takeuchi, who worked on the original title and Resident Evil 5, says Lost Planet 2 won't be trying to find that blend. At its best Lost Planet 2 is a sort of inverse Shadow of the Colossus. "Inafune talked about Dead Rising 2 being a game trying to combine the best of Japanese and western design and make it into something new," Takeuchi said. "I think that's a great idea, but Lost Planet 2 is taking a slightly different approach. "What we are trying to do with Lost Planet 2 is different. We want to take a Japanese designed game and make it a success in the west."